2. Give back to the environment. Throw those water/wine bottles and pop cans in a bag, and recycle when it’s full. 3. Whenever you purchase a new item of clothing, automatically select something in your closet to give away. Put the items to the side and donate on a monthly basis or at the start of a new season. 4. 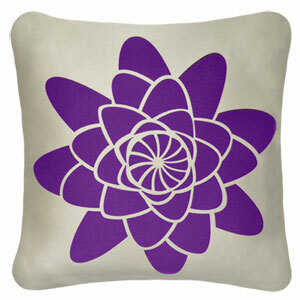 Decorate your home with items that benefit a great cause, like the beautiful pillow below found on BuildANest.com. NEST provides micro-loans to female artists in developing countries, sells their crafts in the US, and recycles the money back. 5. The lotion that you never opened? The makeup samples still in the package? Gather those things and give to a local women’s shelter. You’d be surprised how new perfume or lipstick can help lift spirits of women going through difficult times. 6. Next time that you host a get-together, ask your guests to bring a canned good. Then, take the items to a food bank in your area. 8. Incorporate awards, “Thank You” letters, and other “gifts” from charities into the decor of your home. Last year, a 5-year old sweetheart made me a card complete with a heart, glitter, and my name. That beautiful piece proudly hangs on my fridge. It always makes me smile and reminds me of our fun time together! 9. Like fresh flowers, fruits, and veggies? Purchase your goods from a community garden or co-op. Your patronage will not only help to support the garden, but also any other programs/services provided. If you have any ideas to add, drop them in the comments box! I’d love to know what you guys are doing! Teresa- Glad you enjoyed the post! I already do 2,3,5,7 and 8, but the others are GREAT ideas that take very little effort, so I’ll see if I can incorporate them. 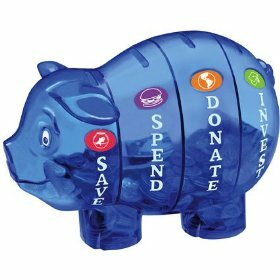 I love the donation pig too. Great post! These are fab ideas Karyn! I’m definitely going to have to remember these to “christen” my new place with charity & positivity! Thanks, girl! Are you leaving the neighborhood?